When the Lord speaks I listen and when He commands I do ask He asks. Well, today he commanded me to “buy the muffin”. I can’t help but giggle as I write this post, but it’s true. It was a simple commandment to buy someone a muffin and I did as He asked and I did it joyfully and I cannot tell you how wonderful it feels to bless someone. Especially someone you can relate with. Today I made a stop at Dunkin Donuts to treat a sweet friend to a coffee and while in line thinking about what I wanted to order there was a beautiful mother with 2 littles ordering what I overheard to be some birthday treats for an adorable superhero and then she ordered a muffin for what I can only assume was for herself. After ordering she handed the cashier a gift card and then after hearing what her total still due was, asked if was ok to take the muffin off her order. She was still all smiles and full of joy as she politely and unselfishly gave up the muffin. It was in that moment that I started to imagine the thoughts running through her mind as a mother and started picturing myself in her very shoes and knowing I’d do the very same thing. She may not have put that muffin back because she didn’t have the money, but maybe she thought that those extra couple dollars didn’t need to be spent on her and maybe didn’t need to be spent on a muffin. She would just use up her gift card and then whatever she still owed out of pocket she’d pay without reservation since they were sweet treats for a sweet moment. As a mother, I do stuff like that all the time. I’ll want to treat myself to something, but then realize, nah, I rather my sweet boys have an extra donut for later instead of me enjoying a muffin now. I never feel sorry for myself, I never think twice about; it’s my heart as a mother to ensure my boys have a smile on their face. I’d spend my very last dollar on them even if it meant that I’d be hungry. It’s what some of us do as mothers and we do it with pure joy. As I got back to the office I thanked the Lord for allowing me to bless her today. Even if it was just a simple muffin, I thanked Him for the opportunity to not only bless her, but to recognize that the world is a better place if we stick together, learn to understand one another, and to be there for one another even in the simplest of moments. What do I mean by that? 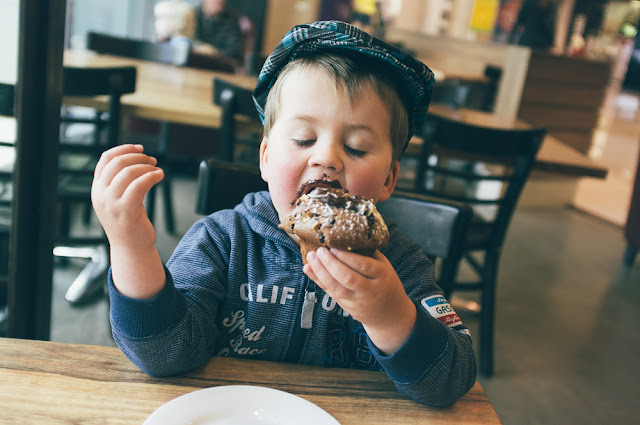 There could’ve been another person in line behind her without kids who didn’t understand one bit of her joy, understand her reasoning for putting back the muffin, or even cared at all about it. Instead, He placed me there to watch her beam a special light of love for her kids and to help me to realize there are times as mothers when we just really want the muffin, but He knows we won’t buy it for ourselves. I took the moment to relate to her because I could and the Lord let me buy her that muffin. My encouragement to you, is not only pay it forward, but take the time to relate and pay it forward because you understand what it would mean to you to enjoy a muffin. I pray that you got to fully enjoy at least part of that muffin because if you’re anything like me you probably shared it with your hubby and your kids. ;) I pray that you know just how amazing of a mother you are and that you are loved and appreciated. Thank you for shining a beautiful light today. A light that I recognize comes straight from your heart. You’re doing an amazing job!